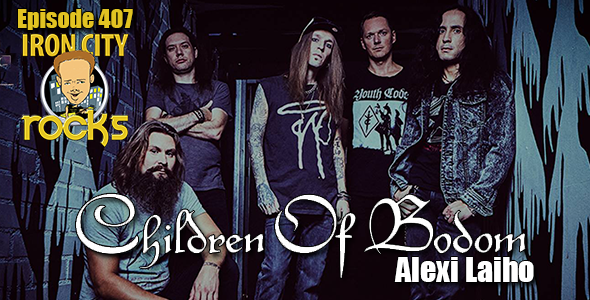 In Episode 407 of the Iron City Rocks Podcast we are joined by Children of Bodom’s Alexi Laiho. Alexi talks with us about the new album, Hexed, how his style of playing and singing have changed over the band’s history, the challenge of putting together a set-list and more. We are also joined by by Kerri Kelli of Night Ranger and A New Revenge. Kerri talks to us about how the stars aligned and Tim “Ripper” Owens, James Kottack, Rudy Sarzo and he came together to form a band, their new album Enemies & Lovers, and more. We also discuss Night Ranger’s plans and reflect on Kerri’s time with Jani Lane in Saints of the Underground. We also introduce guitarist Brady Novotny who has recently released Passions Collide on MTS records.